Hi there! It's the first Saturday of the month again and that means that one of my Guest Crew Members is here to inspire you! Today it's Revlie with a beautiful art journal page in awesome colors. I love the effect of modelling paste and watercolours and also the way Revlie used a leaf mask to create a flower! Hi there! It's the first Saturday of the month and that means that one of my Guest Crew Members is here to inspire you! Today it's Revlie with a beautiful art journal page in some of my favourite colors. I think it is pretty smart how she combined my masks with watercolor. Watch her video for detailed instructions. Enjoy! Using watercolors with a stencil can be very challenging, but it is going to be very easy, if you first outline your stencil with a pencil. This is a quick & easy but mostly fun way to use your stencil differently! Have fun creating! Hello there! It's Crew Member Wednesday and today we have Karin who created a beautiful page with the theme "Image a world where..." And what would be better than to combine that quote with John Lennon and my "All you need is love" stamp set? The first word of the prompt -> Imagine -> made me think about John Lennon. And John Lennon sang a lot about peace and love. That's why I decided to use the "All You Need is Love" stamp set. I looked on the internet for a picture of him and I found this picture of John Lennon and his love (the picture is not of a good quality, but I used it anyway). Hi there and welcome to Crew member Wednesday again :) Today we have a beautiful post by Linda who made a hide and seek journal with loads of pockets. You just HAVE to watch the video to see a flip through, it's amazing! I just love the abstract painting in black and white combined with the brown craft paper! On this month theme Hide and Seek, I’ve made an art journal book recycling various brown paper bags and envelopes. All the natural pockets from the bags and envelopes are perfect for hiding notes, pictures and other papers you want to keep. The book cover is made out of cardboard, you could use a cereal box or similar type of cardboard. I’ve decorated it, using some of the techniques learned from an online class with Jane Davies this summer. In the video you can see how I made the spine, put the book together and of course decorated some of the inside. Backgrounds ready for whenever I need them. Here you can see one of the side pockets, almost all pages have one pocket either in the top or on the side. Hopefully this inspired you to create your own book with lots of pockets to hide stuff in. Crew Member Wednesday With Marsha! Hello! It's Crew Member Wednesday again and today it's Marsha's turn with a colourful art journal spread. This month's theme was alphabet soup and I love how Marsha used scraps of text paper from a magazine as a base for her pages! Hi there! It’s Marsha Valk here today, sharing a colourful art journal page! The theme this month is Alphabet Soup, so I decided to start by tearing loads of letters and words out of magazines and pasting them into my art journal using matte medium. Once the collage was dry, I added one coat of white gesso on top and covered the page with acrylic paint in yellow and pink shades. Next, I stencilled another layer with white, light blue and green acrylic paint and I also stamped a couple of circles from the ‘Scribbled Leafs & Textured Circles’ set using three shades of waterproof stamping ink. Some of the original collage was still shining through, and I traced random words and letters with pencil and paint marker. I also added words and phrases from a couple of Birgit’s stamp sets with black waterproof ink. The Mixed Media Flowers were first stamped on pattern paper (for dressmaking) and then adhered to the page with matte medium. I painted around the flowers with white, yellow and pink acrylic paint, to make them blend into the page. The next step was to add doodling, more stamping, more stencilling, more marks and at last some lyrics to finish it off. Hello there! It's Crew member Wednesday already again and today Karin is back with one of her beautiful colourful art journal pages. Oh my, look at all the little details here! Follow along with Karin as explains how she created this spread. First I stamped the flowers on a piece of paper and cut them out. Then I colored them with ink. I scraped some pink paint over the pages in my journal using a (bank)card. I made some colored background paper using my Gelli Arts® gel printing plate and silk paper. Because I love some texture on my pages I wrinkled the silk paper. I tore the paper in pieces and I glued it on the white parts in my journal. Then I gave it a white wash with some paint and made some marks with a background stamp. After that I apllied some black texture paste through a stencil. I also stamped some branches over the pages and colored them with a white pen. I glued the cut out flowers on my background, used a white pen to add details and finally I sprinkled some gold ecoline over the pages and added the quote. A Colourful Weekend At North East Art Workshops In The UK And Another One Coming Up In October! Last weekend I have been teaching at North East Art Workshops run by Sue Tucker. It was my 3rd time over there and I loved going back. OK, no long stories here, just a bunch of pictures to give you an impression of the workshops and all the beautiful work that was made by my awesome students using Carabelle Studio stamps and stencils, Gelli Arts® gel printing plates and DecoArt® Media products. Day 1, All Mixed Up Art Journal Workshop. Collages made with gelli printed papers. Day 2: Gelli Printing Techniques 2.0. A big thank you to Sue, Debbie, Leroy, Kassa and Rae and everyone who attended!! If you are interested in taking a workshop with me in the UK then check out "Color Crush Retreat" in Coventry, UK in October. I am co-teaching this 3-day art journal workshop with my sweet and mega talented friend Nathalie Kalbach from the US. And with co-teaching I mean that we are teaching the same class at the same time! This means that you will get different approaches to the same techniques showing there is no right or wrong way. You will start with a stack of white paper and go home with an art journal filled with color and techniques! For more info and to sign up visit North East Art Workshops or message Sue Tucker. Nathalie and I would love to have you in our class!! 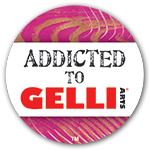 Check out the blogs from Carabelle Studio, Gelli Arts® and DecoArt® for awesome inspiration!